Earthscape (Director, Eiki Danzuka) was responsible for total direction and arrangement of a "Theo Jansen Exhibition," on view at the Oita City Art Museum from July 9th to September 30th, 2011. This summer in Oita, Japan, a highly original installation opened featuring Jansen's Strandbeest ("Beach Animals"), and direction/space design by Earthscape. The installation of Jansen's works in the space captures both the natural setting of Oita and the Dutch landscape, and actively draws visitors in. By installing various devices we created an exciting space -- children entering immediately want to rush in and examine the installation. The composition and direction of the space serves to narrow the distance between spectators and art -- which tends to become too highbrow -- and also fully engage Jansen's concept, which is simultaneously philosophical and humanistic. As if by chance, the resulting experimental exhibition space design embodies Jansen's identity as an artist and his working philosophy. Dutch artist Theo Jansen's Strandbeesten ("Beach Animals") are giant structures assembled exclusively from everyday materials available in DIY shops in the Netherlands, such as plastic tubes. When wind blows into them, their many legs move dextrously, enabling them to walk. These lifeforms possess a mysterious appeal and continue to evolve at the hands of Mr. Jansen. The Beach Animals have traversed the oceans of the Netherlands to arrive in the forests of Oita. Earthscape has added various features to the space using the earth itself: sand, driftwood, and flora from Scheveningen in the Netherlands, as well as pine cones collected in Oita. The exhibition has been structured into three zones: "sea," "life," and "forest," allowing visitors to vicariously experience the evolution of the Strandbeesten. Just as the natural scenery of faraway Holland and Oita are connected by horizons, so are all living things connected. To express these "lines" of connection, we have inscribed various information such as words, photographs, and images between the show's entrance and exit, at a height of 145 cm (the eye-level of a Japanese person). A pack of Strandbeest come from the sea into the forest. They live by eating wind on the beach, and over the years undergo various evolutions. The forest and the sea share a connection as a single life form. The forest acts as a natural dam to protect against river flooding and droughts, and brings nutrients to the sea to help its phytoplankton and marine algae grow, and its fish prosper. Without the beautiful forest, the beautiful sea cannot exist. Just as humans evolved from the ocean, the Strandbeest, too, may leave their beach and begin an evolution into the forest. How will they choose to express themselves in Oita, home to both luscious oceans and forests? This exhibition is composed of three zones: Sea, Life, and Forest. Sea is a place where you can sense the beach and the wind. It is a zone where those Strandbeest who became extinct during the course of evolution stay. 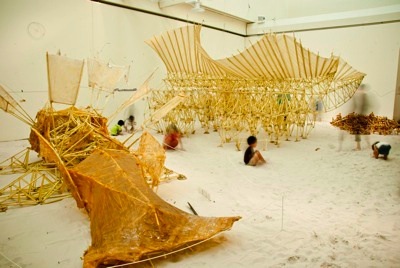 A bed of white sand has been installed on one side of the exhibition space, displayed alongside seashells, driftwood, and flora from the beaches of Scheveningen. Life is a zone where visitors learn about the process of making Strandbeest, and where children blow life into Strandbeest through straws(plastic tubes). And finally, Forest is a zone where you can watch the Strandbeest move, with the forest of the Ueno Hills in the background. Pinecones, tree branches, and bamboo have been carried in from the forests of Oita, and the Strandbeesten begin their journey to the forests of Ueno. We drew a line, about eye-level, on the wall. The line appears in the space in various forms; at times as text, at times as the outline of a landscape, and at times as the level of water. The line presents many kinds of information, including information on the Strandbeest, the wind and forest, and the nature of Oita and the Netherlands. It indicates the horizon of Beppu Bay that would otherwise be visible from this location, and hints at the horizon of the Netherlands, connecting even further beyond... Through the Strandbeest, we invite the viewer to feel the connection between life and nature. Theo Jansen (1948) studied physics at the University of Delft (The Netherlands) from 1968-1975. He left University to be - come an artist. He painted for the first seven years. In 1980 he built a flying saucer (15 ft flashing lights, beep sounds) that flew over Delft and set the town in commotion. Then he built a light sensitive spray-gun which paints an object on a surface. Since 1986 Theo Jansen has been writing a column for the Volkskrant (national newspaper). Since 1990 he has been working on a new creation: skeletons made of electric-conduits which walk on windpower. These animals have evolved into several generations over the last twenty years. Eventually he wants to put the animaIs out in herds on the beaches, where they live their own lives. Eiki Danzuka. Landscape designer. Born 1963 in Oita, Japan. After graduating from Kuwasawa Design School in Japan he attended the Environment Art Studio, headed by artist Nobuo Sekine, and founded EARTHSCAPE. Considering the devices that create connections between humans and nature as design, EARTHSCAPE enact design works that become a platform for experience. "Earthscape" refers to the blue, round shape of the earth as seen from outer space. With landscape design as their primary axis, EARTHSCAPE is involved in a wide array of activities, including the MHCP/www.mhcp.jp, that seek to contribute to society through design. Their major works are landscapes of the huge complex, public facilities and residential.